A video showing how to use the setting Master or Override that is present in all of the lesson planners except AU and C.
The video is brief, but using the setting is simple. Master/Override ultimately controls how lesson plans are fetched from the S-Sheets. 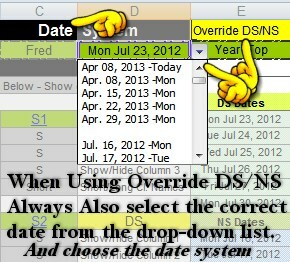 The selection Override DS/NS allows a different DS/NS setting per subject while the top selection controls only the dates shown on the planner. The selection Master DS/NS causes the top DS/NS selection to control all subjects in the lesson planner with one system. When using the Override setting, also set the date in the drop-down list.